Jack of 3 trades. Master of none. 1. 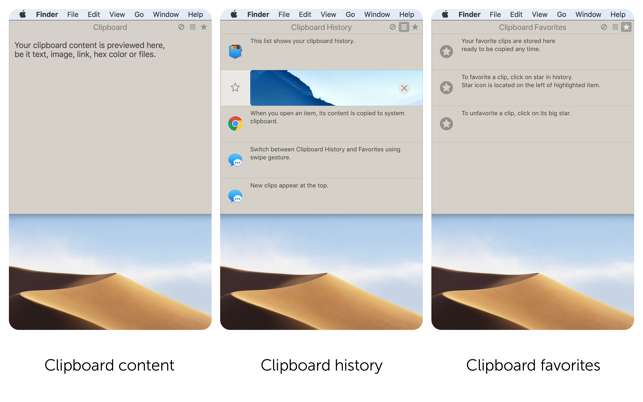 Clipboard history size is too small. Other CB managers allow for thousands of items (which is what I use). Alfred sets limits based on time - 3 months for example. Until this is resolved, I can’t use the clipboard feature at all. 2. 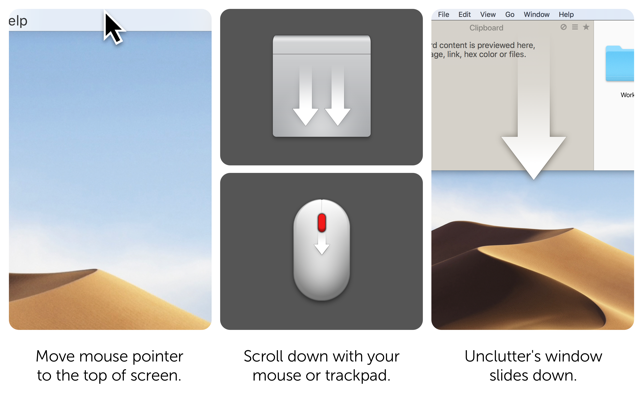 As others have said, the clipboard needs to have an option to paste on click. 3. It would be nice if notes could integrate with the actual notes app rather than saving text documents. 4. Basic markdown support would be nice as well. 5. There’s a bug in the “or just press” field in preferences. Clearing the field does not clear the value. It can only be replaced by something else. This is a minor issue and easily ignored, but worth mentioning. 6. As others have mentioned, the option to actually move a file vs save a reference to a file should be an option. Yoink seems to handle this better, so I’ll keep using that for now as well. 7. Likewise, files dragged as a group should remain grouped so they can easily be dragged out. Again, Yoink and Dropzone seem to get this right. So overall, while this is a good app, none of it’s three tools are better than the tools I already use for each purpose. That said, I’ll keep an eye on future development as I’m sure the app will continue to improve. 1. The ability to change the font (size, color, style) of your notes. Perhaps support for RTF would do the trick. 2. Included an option separate panel as a scratchpad. That could be a replacement for the stock Stickies app and would be highly useful for jotting down content that doesn’t merit saving as a file/note. For my particular use-case, the ideal layout would be: Clipboard | Scratchpad | Notes. 3. The option of setting line preview preferences for Notes, something as simple as 1-3 line preview as found in most email clients. Teh addition of this feature would allow either more Notes to be displayed and/or give the user a better understanding of the Note’s contents. And finally, I have noticed one minor issue. At times, the app disallows the ability to delete a note. 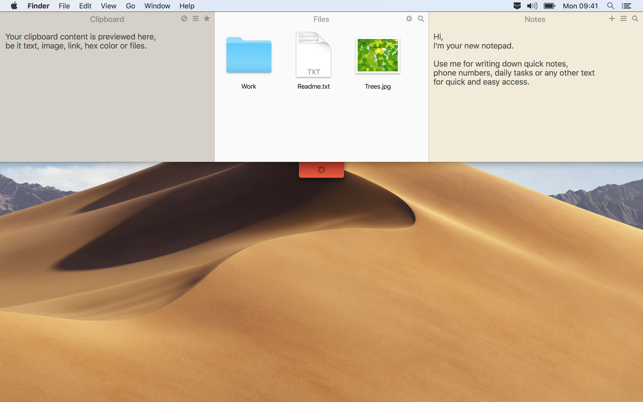 I haven’t yet figured out what triggers this, however, the simple workaround is to manually delete the unwanted Note(s) from within the Finder window. However, this is a drawback from the convenience as you need to navigate to the directory and select the correct file(s). Thank you! Great feedback! Can I kindly ask you to give more details on request #2 and the issue with deleting notes, please? Write me to support@unclutterapp.com. This app could be better. I like all of the (three) things that this little app does. However, while viewing your clipboard history, and even identifying which clips are the most important, doesn’t mean that you can REUSE those clips. All I’ve been able to do is look at them. Why can’t I click on an item in the clipboard history and either copy it, or else have it be pasted into a document I’m working on? Also, if, as other reviewers said, this app actually MOVES your files and folders to somewhere deep inside of the operating system, then how do you get them back? And, if you are using Dropbox or some other service to save your files online, then it seems as though the files on Dropbox won’t be the same as the ones you are working on (but you won’t know it). Hi! Thank you for the feedback, Endnoter! We now have a big list of small and big improvements for the next major update. And we're moving forward to make Unclutter better. But I would like to write a few things so you can get better experience with Unclutter right now. 1) CLIPBOARD. Once you select a clip in the list (History or Favorites) the content is copied into the system clipboard. All you have to do now is go and paste. 2) FILES. 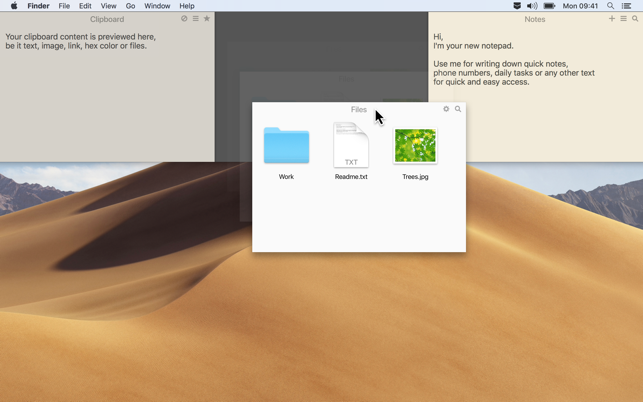 The Files panel is pretty much like a regular folder in Finder, but with quick and easy access. You're right - MOVE operation is the default one. You can use modifier keys to change the dragging operation (ALT, CMD+ALT, etc). You can also specify a location where Unclutter stores your files (see Unclutter Preferences, Files tab). 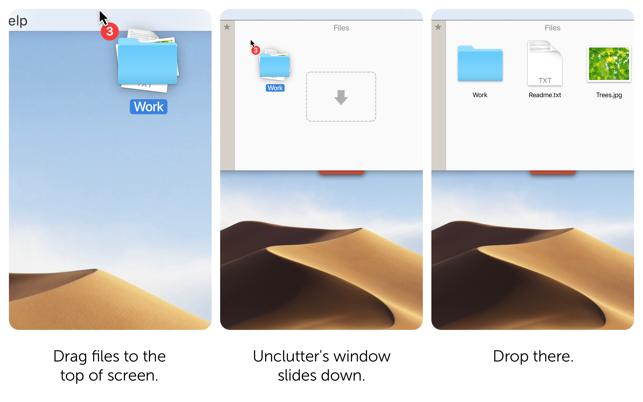 Select a folder inside your Dropbox to have your Unclutter files synced automatically. If you have questions or suggestions, please write me at eugene@unclutterapp.com. Thank you!